What? My typical shoulderstand exit was to slide my shoulders off my blanket stack. Whether I kept my ribcage supported or only my pelvis, this exit strategy enhanced chest opening and thoracic spinal extension. It made sense to me. Lying in Schumacher’s post-shoulderstand counterpose, I felt fine. Even with my shoulders elevated on my blankets, my head could rest in Savasana position. But I was unclear on the point. He exited Salamba Sarvangasana this way throughout the workshop. So, after the last class, I inquired about it. I had never met Schumacher before. Silver haired and straight spined, composed and gracious, the word “gentleman” came to mind. Without hurry, he explained that he’s bending the neck backward after it’s been bending forward during Sarvangasana. In other words, he is extending (arching) the cervical spine as a counterpose after a significant period of flexing (flattening) in Jalandhara Bandha. The usual counterpose of sliding the shoulders to the floor feels good, he added, because the blankets take over and do the right actions for us. But ideally we should perform these actions ourselves during the actual shoulderstand. First, his answer was reasonable, based on human anatomy and the mechanism of the pose. Second, his answer was experiential, based on firsthand observations. To me, these are non-answers. While acknowledging that all of Iyengar yoga originated from BKS Iyengar, I believe that each pose—and each teaching point—begs scrutiny. Mr Iyengar expected his students to experiment on their own. Even if he demanded deference in his presence, he probably didn’t want them blindly to copy him. Teachers should be expected to delve deeply and even to question authority. But students, too, should be inquisitive and not accept everything at face value. A few years ago, I noticed a classmate regularly doing Salamba Sirsasana (Supported Headstand) on a blanket, not a mat, the typical choice. “Why did you switch to using a blanket?” I asked. “Zubin made us to do it this way,” she said. She had studied with Zubin Zarthoshtimanesh in Mumbai. She wasn’t sure, but she valued his teaching enough to stick with it. Is there a reasonable answer (based on critical thinking)? Maybe mats are too sticky to allow arm adjustment during the pose. Conversely, maybe mats get slick with perspiration in India’s humid heat. Is there an experiential one (based on experiential learning)? Maybe he has observed that students can hold Sirsasana more steadily with a soft blanket rather than a firm mat. Even if we receive a reasonable or experiential answer, we still shouldn’t automatically buy it. Isn’t it important to do our own research and to seek second opinions? Asana techniques are always in flux anyway. Good teachers themselves are constantly experimenting and changing their approaches. 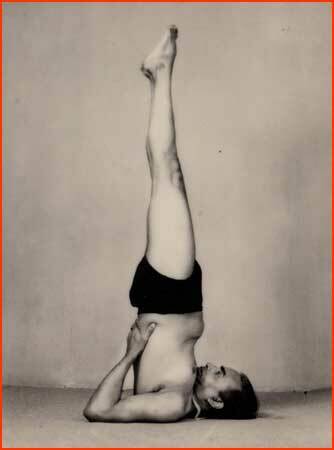 John Schumacher himself doesn’t always exit Sarvangasana as described above (see video below). It’s just the way he taught us at that workshop. Do I now exit Sarvangasana the way John Schumacher taught? Yes, I often briefly remain lying with shoulders elevated, head on floor—and I absorb the sensations in my neck. Then I slide into my standard position, shoulders grounded, to reinforce the Sarvangasana actions. I like the combination. Note: As a teacher, I don’t recommend this exit for students who need substantial height under the head in Savasana. They’ll end up practically in headstand position (on the crown) if they lie with shoulders raised above head level. I agree that Iyengar wouldn’t want us to follow blindly without experimenting and investigating our own bodies. I think this is why things were always changing. He wanted his students to think about what they were doing and what the effects were for different set ups. I notice a few of my students do this after coming out of Sarvangasana because the intuit that their neck could use this kind of release. I was unsure if doing this action would take the nervous system out of the quietness that shoulderstand brings. Thanks for the reflection! Many thanks for commenting. I write this blog not only to express my thoughts, but also to encourage discussion. So I really appreciate your taking the time to share your experience. Thank you for your thoughtful post. It’s always good to reflect on how to exit a pose like Sarvangasana. It makes me think of Geetaji’s response when people ask which way to do a certain pose. She says quite sharply: “Can’t you try both? !” Which leads me to think we should remain discriminating about poses and not blindly do them the way we always have. I practice with another teacher and we often show each other a different way we’ve learnt to set up or exit a pose. Keep on sharing, we appreciate it! Glad to hear from you, Jayne. What an apt quote by Geeta! Techniques are in flux; nice. In Sirsasana in Pune 1x we did with blanket, another time with mat folded 2x. But there is a problem with the mat. A senior teacher once challenged why we use the mat. We had no answer. So she made us stand on it in Tadasan and close our eyes. This cleared it up. Blanket was better. I hadn’t watched John’s exit from the Sarvangasana. By taking his hands backwards when rolling out of the pose it causes his throat to kink up and his head to bob back (like a hyper-extension of the cervical spine). For this reason we don’t take the hands back anymore (which was in aid of supporting the decent). Rather we take them overhead and that has an easier effect on the head/neck/throat area. But it depends on what what has been done with the legs prior. This ‘new’ method is dependent on coming into Halasana 1st (and not bending the knees to the chest as John did). Then your body is stable. And then it’s easy to take the hands overhead.